Some great feedback from our satisfied clients in Benfleet and across the country. "My husband and I were grateful for your thorough survey and are grateful for the report you have provided. We agree, there is a lot to carefully consider and weigh up. Was good to meet you and we thank you for providing us with excellent service." "Thank you so much for the detailed survey you carried out last Friday. Your report will greatly assist me in prioritising works needed to bring the property back up to a pristine condition." 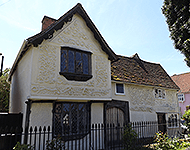 Providing a full range of building surveying services to owners and occupiers of residential, commercial and industrial premises in and around Benfleet, the Right Surveyors fundamentally understand that each client has different budgetary and unique property requirements.